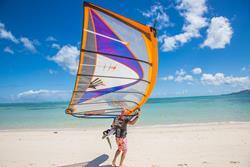 Jem Hall is back in Tobago in 2018 for week long pro coaching clinics for intermediate to advanced windsurfers. Get 'Learning & Liming'! Book 1 or 2 weeks clinics or 1 week clinic and 1 week to practice (or relax) at the amazing Pidgeon Point lagoon spot. "Tobago for 2015, 2016 and 2017 have been a huge success! The amazing Caribbean island of Tobago, in the southern Caribbean sea, is designed for improver to intermediate / advanced windsurfers. If you wish to enhance your stance, footstraps, beach/waterstarts, gybes, tacks and all-round sailing skills at this great venue then please book early as it will sell out super fast each year. Pre bookings already very high!" Week 2 12-19 February 2019 LAST SPACE ! I will be coaching through the use of simulators, on-water coaching, pictures and video coaching. The course content will be relevant to the ability level for that week and individual needs. The equipment is current Fanatics and JPs, with Neil Pryde and North sails. We are mainly using the wide thin boards like the Gecko and Magic ride which are amazing for improving on! INTERMEDIATES - ADVANCED PERFORMANCE BOOST Ultimate Spring tune up. 1 or 2 week clinics. Progress your water starts, gybes, tacks, freestyle and jumps on the amazing Caribbean island of Tobago with Jem Hall in 2019. Week 2 12-19 February 2019 LAST FEW PLACES NOW!